No, this doesn't exist yet, but it may be just a matter of time before marketers look to colonize your wrist. Will your wrist be the next billboard? With new entries from Sony, Samsung and Motorola hitting the market, plus rumored interest from Apple, smartwatches appear to be the next emerging category in computing. Some 15% of consumers are currently using wearable technology, a category that includes fitness bands and smartwatches, according to a recent study by Nielsen. Historically, such interest has meant Madison Avenue can't be far behind. "It's always app development followed by ads," said Jefferson Wang, head of wireless and mobility at the IBB Consulting Group. That doesn't mean your Pebble or Sony SmartWatch will start hitting you with banner ads this year. As manufacturers try to sell consumers on smartwatches, they'll keep ad efforts at bay. After that period, however, smartwatches could be a new frontier, one in which advertisers will need to be heavily restrained, but potentially reap big rewards. Not everyone thinks smartwatches represent an exciting new ad medium. "Smartwatches aren't going to give you a big difference over mobile phones," said Doug Hecht, president and chief operating officer of digital agency Digitaria. "A smartwatch doesn't represent anything important for advertisers right now." At best, smartwatches will be an extension of mobile advertising, Hecht added. "It's really just an incremental play on mobile." Like others, Hecht thinks that could change if consumers are willing to give up more data about themselves, which would let advertisers present more targeted ad messages. 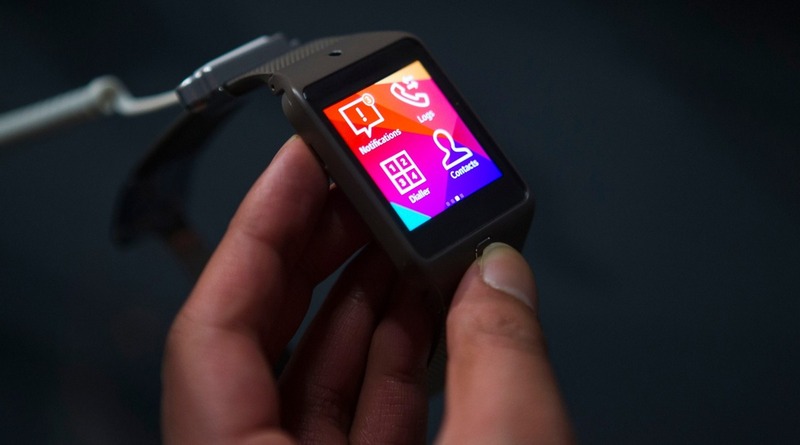 A Galaxy Gear 2 wearable device is arranged for a photograph during a Samsung Electronics news conference on the opening day of the Mobile World Congress in Barcelona on Feb. 18, 2014. 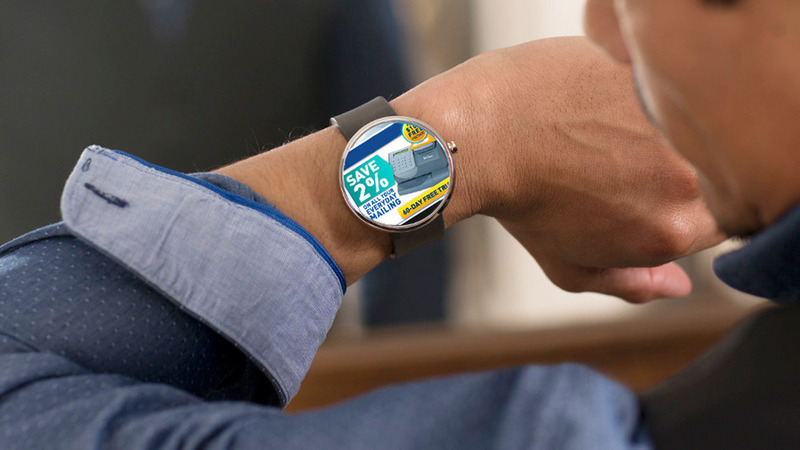 In order for a smartwatch ad message to work, it has to be delivered at just the right time, place and location that makes sense. What's more, a user has to have opted in to receive such a message. The only way this could happen is via advanced hypertargeting. In a perfect situation, you might be visiting a new city for the first time. Suddenly, you receive a message that says there's a nice cafe only a block away, one that a Facebook friend had liked awhile ago. In such hypothetical scenarios, the cafe would usually include a coupon or offer, but Wang said that's not really practical. "It's often embarrassing to use a coupon with people you don't know," he said. "There may be other ways to bring in an upsell situation." For instance, a consumer could check in to the establishment, and then have a dollar quietly added to her credit card. For the cafe example to be viable, search would have to work better than it does now, Wang said. "With Google Now, you might make a joke about the Red Sox and look up Boston, and you'll start getting Red Sox updates," he said. "Other devices will give you more layers." By "layers," Wang means data gleaned from the Internet of Everything, a world in which your refrigerator, thermostat, car, phone and computers all work together seamlessly. Pooling such data will provide a more accurate (and creepy) composite sketch of a target customer. Note that there's nothing here you couldn't also do with a smartphone. However, consumers with both devices might work out a system in which only very special notifications make it to their smartwatch. Wang, who has tried several smartwatch models, said one of the first things you notice about the devices is how often you get alerts. "Watches are really, really tricky," he said. "It's right now a companion device focused on notifications." Wearers quickly learn that they need to shut off a lot of the notifications for texts, tweets, Facebook updates and the like. Otherwise, a smartwatch quickly becomes a burden. 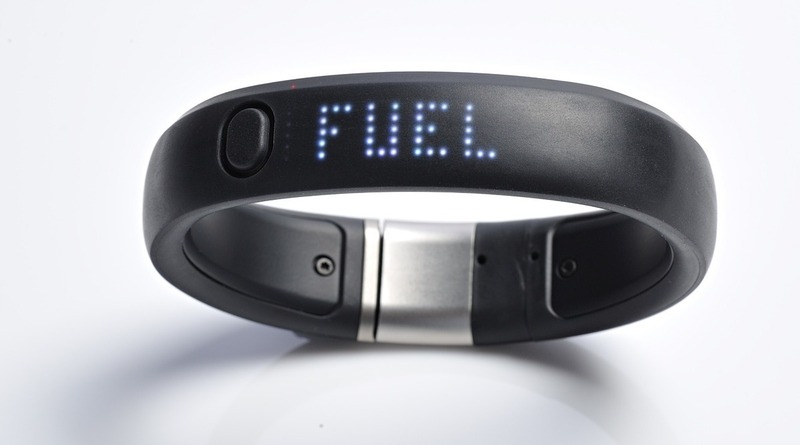 Nike has already expanded into wearables with its popular Fuel Band. If smartwatches catch on, you can bet Nike will be there, too. In addition to monitoring athletic performance, a smartwatch could also be used to help you gauge your overall health. An insurance company, for instance, could offer incentives to lower your resting pulse over a period of time. The app could provide an accurate reading. Or maybe if your pulse started going the wrong way, an ad within the app could suggest a healthy snack. "It might say 'Your pulse just went up, lay off the coffee,'" said John Havens, author of Hacking H(app)iness. Havens also foresees a slightly more insidious use for smartwatches. Retailers, he speculated, could monitor your pulse as you walk through a store. If you see an item that makes it race, they could then present you with an offer. Of course, all of this would have to be something for which the consumer opts in, Havens said. "With such limited real estate, any form of ad behavior, which is not opted in for wouldn’t be a pleasant experience," he said. What might be pleasant is the sort of guided tour of a retail establishment that Apple's iBeacon currently provides. Using iBeacon, shoppers can get messages such as "Your package is ready for pickup," "That painting you're looking at is by Da Vinci" and "You can buy that Apple TV" right here. A smartwatch may look like just another screen to conquer after television, computers and smartphones — but it's not. The interruptive model worked fine for TV, print and even to an extent online, but the smartphone ushered in a different relationship between consumers and advertisers. As the line between a consumer's body and her device becomes fuzzier, advertising is perceived as being more intrusive. When you watch a TV ad, you don't feel like your personal space is being invaded, but you do if such an ad is pushed to you on a smartphone, and especially via a wearable device such as Google Glass or a smartwatch. For marketers, the struggle then is not so much how to market to consumers on their smartwatches, but how to get them to agree to let you market to them on their smartwatches. That will require creating a brand that consumers like, want to be associated with and above all, trust. Barring that, consumers will find they have no room on their timepiece for your brand, and indeed, no time for you either.